His story and lived experiences have been featured in numerous media, including the documentaries “Comedy Warriors: Healing Through Humor”, “Healing Bobby”, and “Weight of Honor”; on CNN, PBS KET, NPR, Today.com, and Time.com; Time Magazine, People Magazine, The Huffington Post, Guideposts, and The Nipawin Journal; as well as television, radio, and podcasts around the world. Henline is one of those rare individuals you meet in life that at once can make you laugh hysterically and at the same time remind you to be the best person you can be. A veteran of Desert Storm by age 19, Henline was inspired to re-enlist in the Army after the attacks on America on September 11, 2001. He deployed to Iraq three times, twice with the 82nd Airborne Division and once with the 3rd Armored Calvary regiment. He spent 13 years in the Army. While on his fourth tour in Iraq, three weeks after his arrival, an IED blast blew up his Humvee – April 7, 2007 is a day he will never forget. Of the five men in the vehicle, Bobby was the only survivor. He stumbled out of the wreck, a human torch. Extinguished by the soldier he had replaced in the Humvee, burns covered almost 40% of his body, bones in his face and shoulders were fractured, and his head was burned to the skull. Put into a medically induced coma for two weeks, Henline was flown back to the states. During his initial six-month hospital stay, Bobby remained upbeat, positive, and relied on humor to get him through each day. Putting nurses in headlocks, trying to keep other wounded soldiers’ spirits up by telling them jokes, and singing a ditty over and over garnered the attention of his occupational therapist. She challenged him to go to an open mic night and try his hand at comedy. Today, Henline continues his quest to make people laugh in a variety of venues. The open mic night provided him an opportunity to perform professionally as the “Well Done Comedian” at Brad Garrett’s Comedy Club (Las Vegas, NV), Laugh Factor (Chicago, IL), and Hollywood Improv (Los Angeles, CA) to name a few. 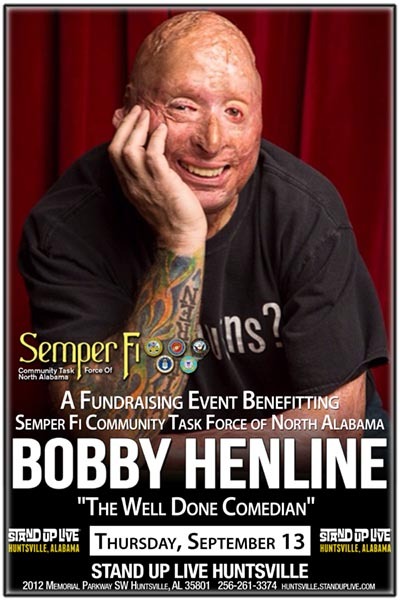 As a Motivational Speaker/Comedian, he collaborates with various military and military-related organizations to inspire soldiers, veterans, and their families, spreading his message of life, love, and joy; he visits high schools across the country; speaks at mental health and other healthcare organizations, military and veteran associations, as well as a host of other venues, sharing his story of resiliency, hope, and healing.